“What was that boom? What was that flash of blue-green light? 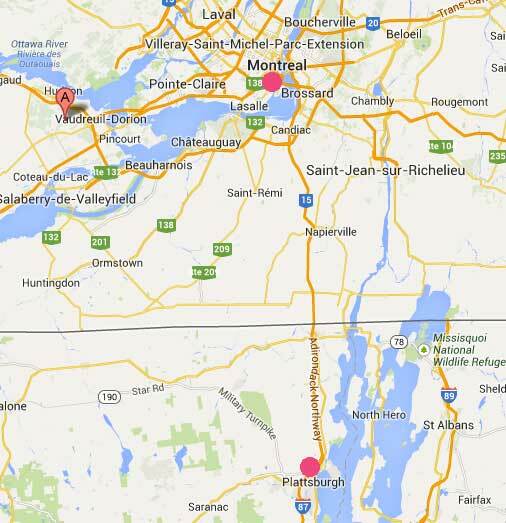 The Google pointer marks St-Lazare west of Montreal, Canada. 64 miles south of Montreal is Plattsburgh, New York. Residents in all three regions reported hearing an enormous explosive boom with a flash of blue-green light around 8 PM on Tuesday, November 26, 2013. No source of the mysteirous loud boom is known. 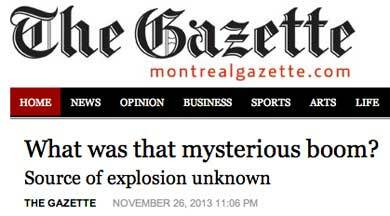 November 27, 2013 Albuquerque, New Mexico - Last night around 8 PM Eastern, residents in Montreal, St-Lazare and the surrounding Canadian region as far as Ormstow and Cornwall, Ontario, onward to Plattsburgh, New York, were literally shaken by a loud boom and a bright flash of blue-green light in the night sky. But no one anywhere – including Environment Canada and St-Lazare Mayor Robert Grimaudo – knows for certain what caused the loud, mysterious boom and light flash over so much geography. One speculation is a meteor hitting the atmosphere with a sonic boom. But mysterious booms – some with bright light flashes, usually white – have been reported around the United States since January 2011 without explanation. See November 22nd Earthfiles and November 24th Earthfiles.